Scientists at The Scripps Research Institute (TSRI) have teamed up with several other institutions and pharmaceutical companies, including the University of Southern California (USC), San Diego's Receptos Inc. and Japanese company Ono Pharmaceutical Co., Ltd., to publish the first 3D structures of a receptor implicated in many diseases of the brain and in normal physiology throughout the body. Surprisingly, the structures revealed a new understanding of the body's use of cannabinoids—a naturally produced substance chemically related to marijuana. The new research, published June 18, 2015, in the journal Cell, sheds light on the molecular architecture of receptors for a family of small fat molecules known as lysophosphatidic acid (LPA), part of a larger class of fat molecules (lysophospholipids) linked to conditions including hydrocephalus, pain, hypoxic brain damage, psychiatric disorders, multiple sclerosis, fibrosis and cancer. "The study has particular relevance to understanding and possibly treating the brain," said TSRI Professor Jerold Chun. "This structure is the first for an LPA receptor—and it revealed a couple of surprises." Chun is co-senior author of the study with Michael A. Hanson, president of GPCR Consortium and former director of structural biology at Receptos, and Raymond Stevens, director of the Bridge Institute at USC and founding director of iHuman Institute of ShanghaiTech University. Chun and his colleagues first identified the protein, called lysophosphatidic acid receptor 1 (LPA1), in studies of the brain nearly 20 years ago. The LPA1 receptor sits within and spans membranes of cells to bind with LPA in the body. When bound, LPA1 sends a signal into the cell to influence a range of functions, such as cell migration, shape, survival and proliferation. While the scientists knew the importance of LPA1, the Chun lab's studies into the biology of the molecule indicated that it was a kind of G protein-coupled receptor (GPCR), known to be difficult to image. To overcome this challenge, in this study the team used techniques developed by Stevens and colleagues to stabilize the receptor in the presence of drug-like molecules synthesized by researchers at Ono Pharmaceutical. Stevens noted the work by Ono and the chemistry it did to enable the structural biology (with a focus on lung fibrosis) was a big breakthrough. This collaboration enabled the formation of crystals that were used for x-ray crystallography, a high-resolution imaging technique. The resulting data revealed two important features of LPA1. One feature was the discovery that LPA1 lacks any sort of "cap" on top of it. Instead, it has an opening where ligands (binding partners, rather like keys to locks) can slip from the outside of the cell into the binding pocket. 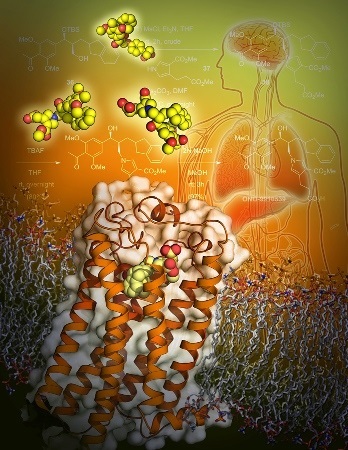 This allows ligands from aqueous sources to avoid the water-repelling lipids surrounding the receptor, solving the long-standing mystery of how LPA bound to proteins in blood and other fluids could easily activate LPA1. Importantly, the researchers found LPA1 has a "baggy" binding pocket, suggesting that other molecules could bind within it. This route of entry contrasts with that of S1P1, a previously crystalized receptor for a distinct lysophospholipid (called sphingosine 1-phosphate or S1P), which possesses a more linear, rigid binding pocket. This structural detail enabled the identification of new ligands capable of activating LPA1. Prior studies from the Chun lab had identified protein sequence similarities between LPA1 and cannabinoid receptors, but the commonly known ligands for these receptors did not activate LPA1. The structural data led the researchers to examine modified versions of cannabinoid ligands that might activate LPA1. The new publication proved this prediction true, providing the first evidence of "cross-talk" between the two systems via a common receptor and establishing a new relationship between two, distinct families of fats—LPAs and the cannabinoids—offering new strategies for understanding and therapeutically accessing these distinct lipid signals. "This series of structures further illuminates the field of lipid receptors enhancing our understanding of how closely related GPCRs distinguish between very similar endogenous ligands not only through binding interactions but also through route of entry," said Hansen. "This is a new way of understanding a fundamental interaction between signaling lipids and their receptors," said Chun. Chun calls the new study the "end of one chapter" his lab started 20 years ago with the identification of LPA1 "and the start of another" through the newly established links to cannabinoid signaling. "This feels good, and I'm happy to have been a part of it," said Chun.